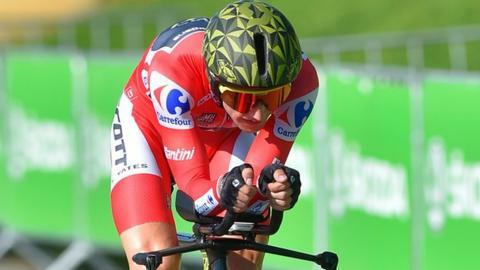 Great Britain’s Simon Yates maintained his overall classification lead at the Vuelta a Espana as Canada’s Michael Woods won the 17th stage. Yates’ lead over Alejandro Valverde was cut by eight seconds to a 25-second margin after the 157km road race from Getxo to Alto del Balcon de Bizkaia. In thick fog, Woods, riding for the EF Education First-Drapac p/b Cannondale team, took the win. Belgium’s Dylan Teuns came second, with Spain’s David De La Cruz third. Woods, who finished seventh overall in the 2017 Vuelta, broke clear with 800m to go to take his first stage victory in the summit finish. “I thought I had less than 800m to go, but you could not see anything up the road,” added Woods. The 18th of 21 stages takes place on Thursday over 186.1km from Ejea de los Caballeros to Lleida with the race finishing on Sunday. Yates is aiming to become only the second Briton to win the Vuelta after Chris Froome’s success in 2017, while Spain’s Valverde is aiming to win the Vuelta for a second time after victory in 2009.